Who says "Bachelor"-related romances don’t last? 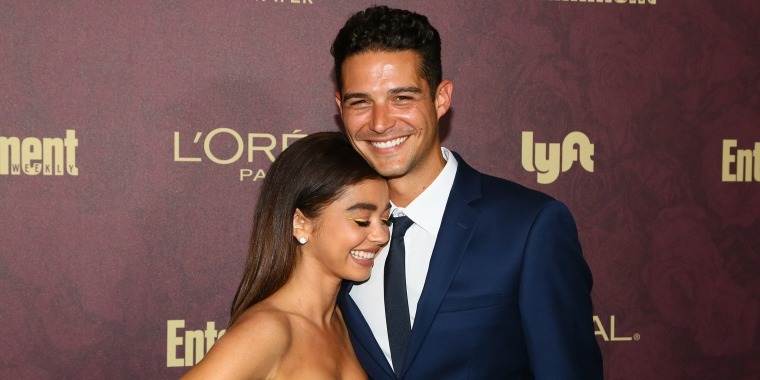 Wells Adams and Sarah Hyland celebrated their one-year anniversary on Sunday and took to Instagram to profess their love. "I kissed this beautiful woman for the the 1st time a year ago today. Best year of my life. I love you to Pluto and back @sarahhyland," the former "Bachelorette" contestant and "Bachelor in Paradise" bartender, 34, wrote. The "Modern Family" star, 27, recalled the couple's first kiss in her post. "1 year ago today, You asked to hold my purse when I was dancing. In that moment you took my heart. You then gave me my last first kiss. And in that moment you took my breath away. I love you to Pluto and back @wellsadams," Hyland wrote on Instagram. The couple met on Twitter when Adams sent Hyland a direct message, and the couple started living together in Hyland's Los Angeles home in early August. “I think it’s brought us closer," Hyland told People last month. "I don’t think it’s been long enough to discover pet peeves with each other."